GBA Mr. Driller 2 (USA) "Time Attack" in 07:28.8 by Kyman. 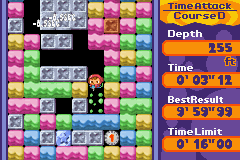 Mr. Driller 2 is a fast-paced puzzle game where you have to drill to the bottom of the level within a fixed time limit. In this run, the author drills through the ten time attack courses in slightly under seven and a half minutes. Furthermore, he aims primarily for in-game time, as it adds to the entertainment value and adds also to the strategy, as there are time bonuses in this mode which subtract time. This is an improvement of 4.76 seconds over the previous publication, with the improvement coming from better routes and better optimization.